at Vairamuthu Sir's 1000 paadalgal event. IMO its one of the best events that I have been a part of. Brimming with scholarship and an energy in the air in the room that I day, I haven't felt for a long while. With the titans from the industry, listening to SPB sir and KJY sir sitting at a 1 feet distance from the performance area. Quite an experience. Listening to Vairamuthu sir read out the citations that he gave out to every guest he had invited was another treat. Listening to Vaali sir's address which left us all in splits and Vairamuthu sir's impassioned one, was amazing. Nothing like listening to poets speak. Especially on their craft, their words and their points of view. Anecdotes and stories and laughter and life. I first performed with Vijay Prakash that day to a monitor-wise highly uncomfortable rendition. I have met him after more than a year, after performing at the VTV audio launch here in Chennai. Definitely one of the loveliest and nicest performers I have met. But thankfully it got better by the time I went on stage for Uyire with Hari ji. And Hari ji actually told me he liked what I sang. Whatt-an experience listening to him sing Uyire. Its a dang surprise every time. Keeps you on your toes all the time. And he brings edge-of-the-seat entertainment to the music listener I think. After the Photo Op with the Honble Chief Minister of Tamilnadu, I decided to say Hello to Superstar on Stage. Babbled and said I am huuuge fan. Yep, as original, impressive, smart and of course, original as that. He says "Yeah I know Chinmayi." .. And a few other words that I don't remember. But in my life I will never forget shaking hands with him. In this aspect I am exactly as crazy as every Thalaivar fan out there. The Superstar is all magic and earth-shatteringly simple. When I was an stage I smiled at him while singing Kadhal Anukkal and he smiled back. At that point in time I had no clue whether he knew me from Adam or for that matter, Eve. I knew in less than an hour later that I was mistaken and he knew me by name. Thanks to the cameramen, a million times for capturing that moment. I have a photograph of it now. The one other thing I will treasure is from the Vairamuthu sir. His words to me, impressed in a sheet of gold. The other treasure, the first one this year, is of course, the calendar :) Glee! Wowww...The best part - Vairamuthu's citation for each guest... !!!! so why have you stopped thanking the kannama donors? u look great n i saw d picture in indiaglitz. Congrats Madam. You must be one of the luckiest persons on earth whom Thalaivar himself knows by name! Looking forward to see your snap with him. Amaazing .... all the best and happppy new year ... keep the articles flowing in :) We are hear to know and read more about you and your experiences. i too felt your joy and happiness reading your experience with our thalaivar....he always watches every one of us especially people like u who r in media light...but we think tat he doesn't know anything...great for u to meet our thalaivar...we always respect u chinmayi...and that lines for u by vairamuthu sir is simply superb.. It is cutting across generations, cutting across from common (wo)men to celebrities like you. You are the luckiest person on the planet...(as you met Thalaivar..). Also i WISH YOU, FAMILY MEMBERS, ALL YOUR FRIENDS A VERY HAPPY & PROSPEROUS NEW YEAR 2011..
My special wishes to you for the MEGA HIT SONG OF THE DECADE "Kilimanjaro" from Super Star's mega blockbuster movie "ENTHIRAN"..
Keep smiling and be happy Chinmayi..
ஆமாம்! கடந்த ஆண்டின் சிறந்த பாடலாக எங்கள் ஊரில் உங்கள் பாடல்தான்! ஒலி 96.8 ல் உங்கள் பாடல்தான் வெற்றிகண்டது! வெற்றிக்கு என்னுடைய பங்களிப்பும் இருந்ததில் இன்பம் எனக்கு! அன்றைய கவுண்டவுனில் நீங்கள் பேசியதை ஒலிபரப்பு செய்து அங்கே கூடியிருந்த 5 ஆயிரம் பேரையும் அசத்திவிட்டார்கள்! உங்கள் முகமும் அங்கேயிருந்தது! அழகிய வருடம் அங்கே துவங்கியது! என் எண்ணம் போல என்றுமே உங்களுக்கு வெற்றிமேல் வெற்றிதான்! வாழ்க பல்லாண்டு, புகழுடனும் வளங்களுடனும்! நன்றி! Very nice post in the begining of this Year 2011.Thanks for Sharing your wonderful momments that you had with the great Legends. may the whole year b as 'glee'ful as it has started!!! In the Making of Enthiran program, you were the only one who mentioned the word - Thalaivar! Thanks for that and Congrats! Who ever posted the Link of the pic ..
Chinmayi . . Keep rocking . Had a chance to see you saturday evening opposite to pothys. You were operating your car. I saw you from my bike in the opposite track. I wanted to get ur autograph but could not. Congratulations Chinmayi. I know what it feels like. I had a similar experience in Los Angeles a few months back at the airport! I saw the whole Jai Ho troupe and my hands were trembling as I went up to speak to the genius Mr. ARR. He was so simple and chatted with me for a few mins. I also went up and spoke to Hari ji and he obliged and sang a few lines for me from my fav ghazal "halka sa ek nasha sa". Have been a lurker at you blog for quite a few years now, and am surprised you are still excited about the words and actions from these celebrities!! How are you not used to seeing/talking/getting praised by these stars yet?? :O Congrats on everything you have achieved in life, from Blue Elephant to Rajni! Thalaivar always know about his fans, and he must have watched "The Rajinikanth Phenomenon" debate and also you are famous enough to be remembered as one of the comments mentioned "you have sung two hit songs for Sivaji and Endhiran". Kindly share the photo. Chinmayi, what most deserving honors for you to bring in the New Year. May it be filled with more joys! @Chinmayi, great lines by Vairamuthu Sir to you... BTW, do you have any youtube link of your performance along with Hariharan. Would love to watch it. Hooked onto it. Great! Keep it up! chella puyal...china thentral...Thamizhil paadum kuyil . 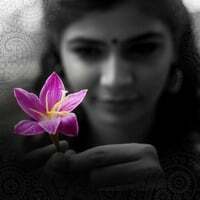 Chinmayi Voice is Rare Indian Pop Singers Voice! . . .
chinnu... i know i am wishing you late... but still a very happy and prosperous new year to you:) i wish you win many many awards and laurels this year... i ll be the happiest if you win a National award...:) wishing you whole heartedly in advance sister... i am expecting one from you... god bless... great to hear that you had such an awesome start this year... hats off to vairamuthu sir.. enna kavignan:)and why dont you share your photo with our thalaivar?? ?